Over 1/4 pound shaved corned beef, sauerkraut, Swiss cheese and special sauce on marbled rye bread, served with your favorite side dish. Our choice cut of ribeye, charbroiled to order, served on a grilled hoagie bun and served with a cup of au jus. Our slow-roasted prime rib, cooked to order, served on a grilled hoagie bun and served with a cup of au jus. Shaved sirloin steak on a hoagie bun served with a cup of au jus. Tender, shaved sirloin steak with grilled onions and melted Swiss cheese, served on a hoagie bun. Boneless chicken seasoned, grilled and smothered with a balsamic reduction, served on toasted sourdough bread with lettuce, tomato, red onion and your favorite side dish. Tenderized loin of pork, flattened and breaded, deep-fried and served on a Kaiser bun. Choice ground beef charbroiled and served on a Kaiser bun. Choice ground beef charbroiled with a slice of American cheese and served on a Kaiser bun. Choice ground beef charbroiled and topped with bacon, mushrooms and Swiss cheese - Delicious! 16 oz. of Alaskan walleye, double breaded and deep fried to a golden brown. Our fresh famous fish breaded in seasoned flour and deep fried (if specifying preference of either rib or tail, an extra $.30 per piece will be added in addition to fish price). Whole, 16 oz. farm-raised catfish breaded in our seasoned flour and deep-fried. Please allow 20 min cooking time! Our delicious chicken, consisting of one breast and one wing, breaded in our seasoned flour and deep fried. Our delicious chicken, consisting of two breasts and one wing, breaded in our seasoned flour and deep fried. Our delicious chicken, consisting of one thigh and one leg, breaded in our seasoned flour and deep fried. Our delicious chicken, consisting of two thighs and one leg, breaded in our seasoned flour and deep fried. Dinners include your choice of 2 side dishes. Hand-breaded boneless chicken breast served with mashed potatoes, our milk gravy and your favorite side dish. 10 oz. of seasoned, hand-breaded steak, served with mashed potatoes, our milk gravy and your favorite side dish. Top sirloin slow roasted over 18 hours, served on toasted sourdough bread, with homemade mashed potatoes, smothered with brown gravy and your favorite side dish. Our delicious chicken, consisting of two breasts and two wings, breaded in our seasoned flour and deep fried. Our delicious chicken consisting of one thigh and one leg, breaded in our seasoned flour and deep fried. Our delicious chicken, consisting of two thighs and two leg, breaded in our seasoned flour and deep fried. A variety of catfish nuggets, chicken, shrimp, famous fish and walleye. Southern style cornmeal breaded pieces tilapia. Fresh oysters breaded and deep fried, available when in season. plus French fries, wild rice pilaf, mashed potatoes and gravy, vegetable of the day or baked potato. 12 oz. 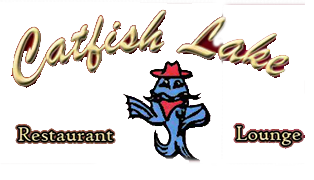 boneless filet of catfish served broiled, deep fried or blackened. Atlantic salmon, char-broiled or blackened, served with garlic butter. Our famous house cut steak, aged to perfection and charbroiled to order. Our famous house cut steak, charbroiled to order. Tasty Omaha steak t-bone, charbroiled to order. Tender house cut filet of mignon and charbroiled to order. Our deliciously seasoned, slow roasted tender prime rib. 8 large butterfly fantail shrimp fried to a golden brown. Our 10 oz. sirloin with 4 fantail shrimp. Inquire with wait staff if you prefer to substitute another steak or prime rib for the club steak. Our club steak served with a half pound of Alaskan king crab legs, served with melted butter and lemon. A full pound of Alaskan king crab legs served with melted butter and lemon. A 12 oz. broiled lobster tail served with melted butter and lemon. Filet served either charbroiled, deep fried or blackened. Fresh from the sea, served either char-broiled or blackened. On Fridays only, from 11am-1pm, enjoy our buffet which includes chicken, catfish nuggets, BBQ ribs, mashed potatoes with gravy, vegetables and coleslaw.